Te Araroa essentially stops at the Lake Coleridge Lodge and starts again on the opposite side of the Rakaia River at the Glenrock Station. I shared a shuttle ride around across to the other side with another south bound tramper Robin. Best decision ever. On getting closer to the river you can see the power of the beast, although where the bridge crosses the channels are narrow and water concentrated, and I was glad not to be attempting to cross on foot. The other bonus is that I save at least a day or two. 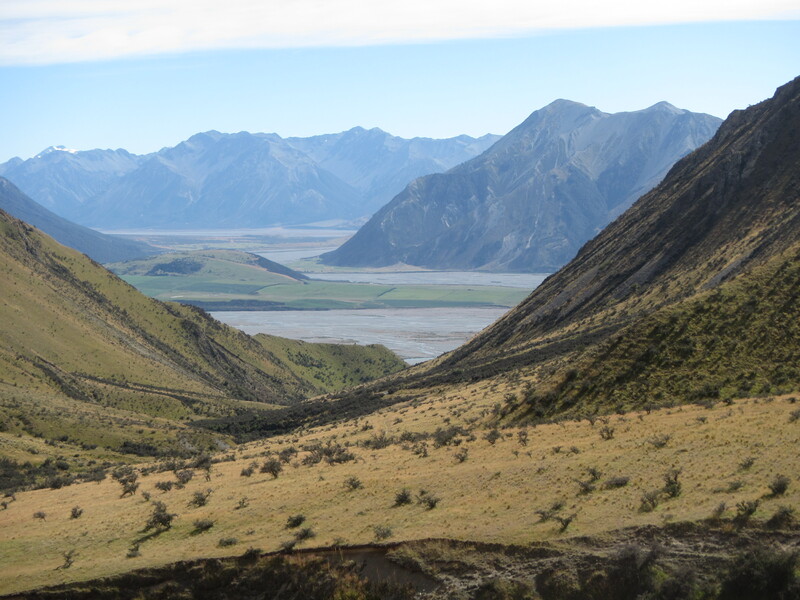 The alternative to a shuttle from the lodge was to hitch down the road to the Rakaia River Gorge and try and get a hitch up the road to the start of the TA but its a very quiet country road with little but local farm traffic – very tricky to get a lift. To walk the 35km to the trail head would have been a full day. The only other option was to get the local school bus up the road at 6am in the morning. This would have been difficult to arrange yesterday given it was Sunday. We were off just before 9am and reached the trail head close to 10 am. From Glenrock Station the walking was really easy following old farm roads through the station and onto crown land all the way to A Frame Hut. There was one steep section up a hill where the old road switched backed about 6 times to reach the top but it is hardly driveable now, maybe on a quad bike, due to large rocks that have fallen and cover much of the track. Once at the top of that hill it was obvious the TA was now leading us through a completly new landscape. The trail has certainly left the forests and entered into high mountains with big, wide tussocky valleys seperating them. Most of the high hill tops were devoid of tree cover and basically just scree and gravel. Just about every gully or valley floor had water of some description, small streams feeding into the bigger rivers below. Views back down the valley really gave you a feel for just how big a crossing of the Rakaia and Wilberforce Rivers would have been. I got to A Frame hut in good time. Having a quick bite to eat I continued on to Comyns Hut continuing to follow on the old 4wd tracks. 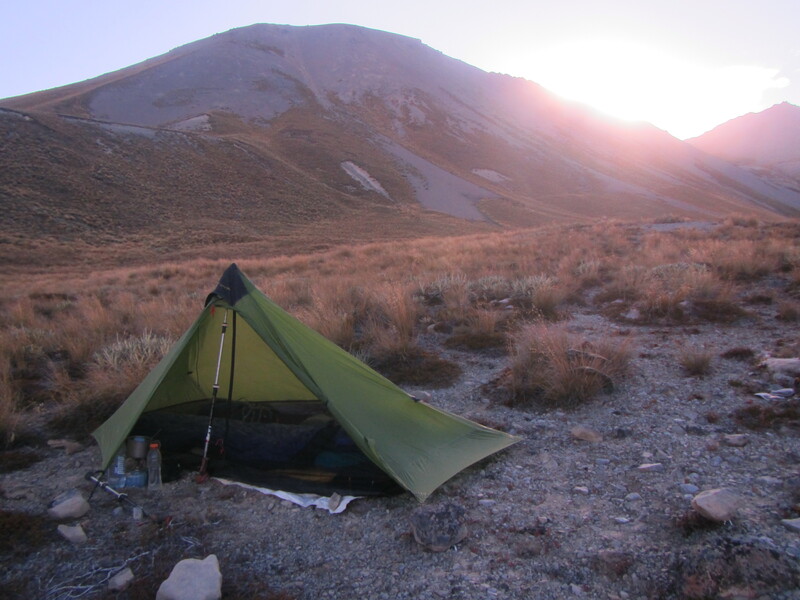 From Comyns Hut Te Araroa follows up the Hakatete River and Round Hill Creek towatds Clents Saddle, a distance of 7km. 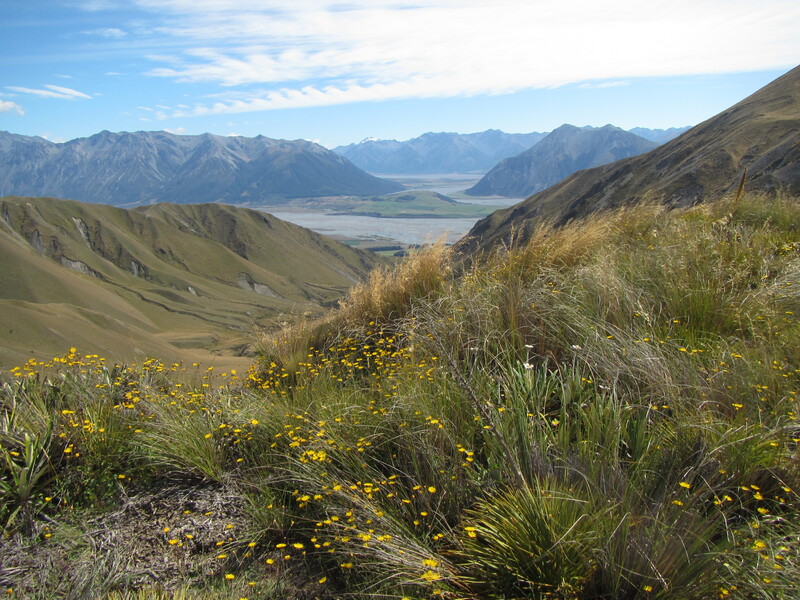 I love Te Araroa and the nature of much of the walking – no sarcasm intended, I really do. Why follow a track when you have a perfectly good river bed to follow instead. And when there is no way around an obstacle, hell lets just walk up the river itself for as long as necessary. The trail was really poorly marked along here but it didn’t take too long to work out where you needed to go. Essentially the rivers just needed to be followed crossing from side to side as rquired where you run unto a rock wall that meets the water itself. There isn’t much of a track of even a foot pad for this section. It was a matter of following your nose and keeping track of navigation. The trail keeps throwing up new challenges each day as well and today it was tussocks and ‘Spiky Spaniard. Once out of the river, the trail lead towards Clents Saddle through thick grassy tussocks. Often head high and at least knee high, they obscure any sign of a food pad, cover hidden small depresssions that are waiting to catch an ankle or leg; and try and trip you themselves as you step on the fronds touching the ground under one foot while the other foot is caught as you move it forward. The other challenge for the day was Spiky Spaniard or speargrass, a small plant that has evolved long needle like leaves with razor sharp points all pointing in a direction that it you step on them they bite your lower legs. I had knee high gaiters for just this thing but my problem was today I had my ankle gaiters on with the long ones buried at the bottom of my pack. Lessopn learned. Long gaiters for sure tomorrow. 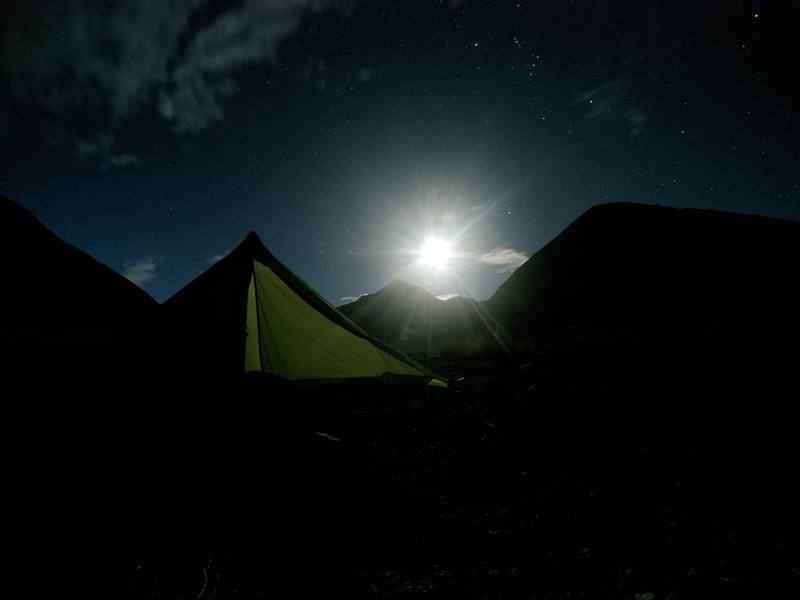 I didn’t quite make it to Clents Saddle today and opted to camp on an open gravel high top about a kilometre short. What an amazing night though. A still, cloudless night. 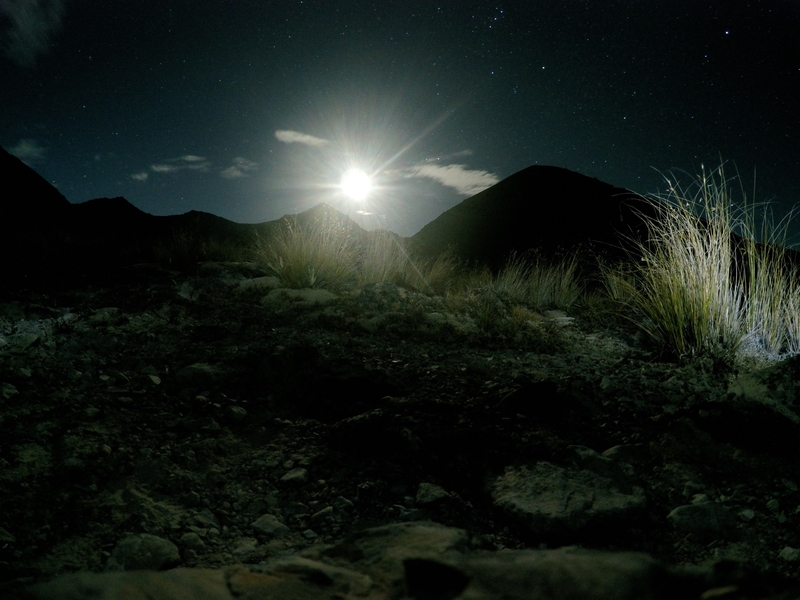 This made for a brethtaking display of stars on a deep black sky with a waxing half moon rising above the horizon of big mountains. I woke in the night around 11pm and was so blown away by the stars that I had to get up and try my hand at some night photography. 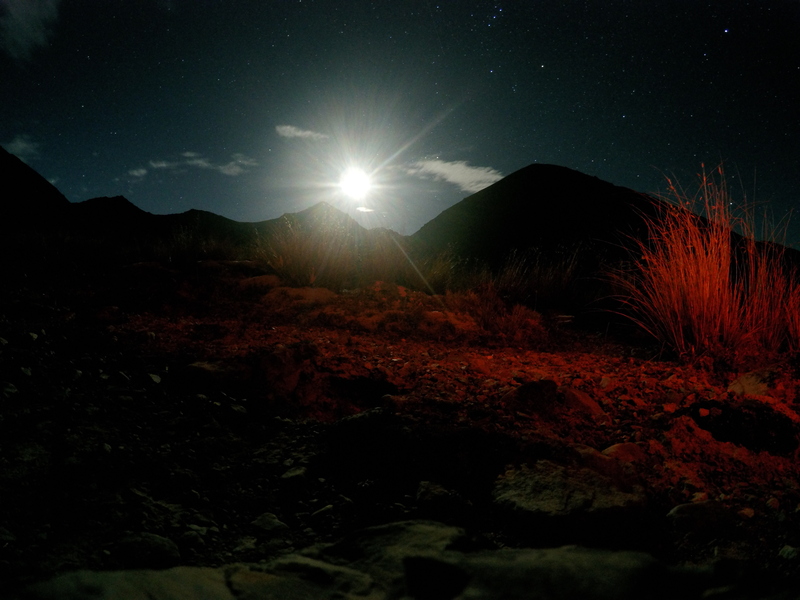 Not the best with a small camera – its no SLR. A great way to end the day. Sorry WT, just couldn’t do the scene justice on my point and shoot camera.